Based on the command "sloppy", you can deploy, maintain, and monitor your projects and apps through your UNIX-based or Microsoft Windows terminal with our CLI. Here is our full CLI reference. The best way to compose your projects and deploy them with either the CLI or Web UI is to describe them in our own JSON format. In structure and key-naming, the JSON format is based on the standard docker-compose.yml and integrates specific sloppy.io features. Here is our full JSON reference. Apart from JSON, we're also giving you the opportunity to compose your in project in YAML and our own markup. You can also use a docker-compose.yml with very few exceptions noted in our references for JSON and YAML. Here is our full YAML reference. 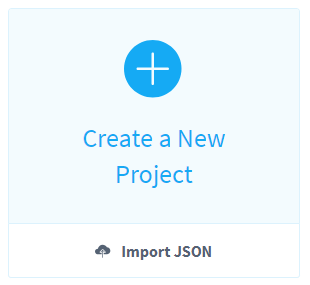 To create a project from a source file in JSON format, you can import it in your dashboard, under the option to create a new project. In turn, you can also export your finished project to a JSON file to re-use or edit it to optimize your composition. Open the the Details of your project in your dashboard to select the download option from the top, next to your project name. To help you in downloading, installing, and using the CLI to create your first projects, we've set up a step-by-step guide in the Getting Started section of the knowledge base. For further instructions, head to the CLI reference.